NASA’s satellite images of the Korean peninsula at night are a well known and graphic visualization of the huge gap in economic development between North and South Korea. But it turns out, there are other lessons that can be learned from nighttime pictures of North Korea. An economist at Stanford University has studied almost two decades of satellite pictures of the country to conclude the government in Pyongyang is shifting economic activity to industrial centers, reducing the effect of sanctions on city dwellers while increasing their impact on those in the countryside. Lee Yong Suk analysed nighttime images taken by the Defense Meteorological Satellite Program, a U.S. Department of Defense program from which images of the world at night are made available. Lee divided North Korea into square mile grids and came up with a measurement for average luminosity of lights. He relied on a theory that the level of light in a town or city indicates the amount of economic activity there, and was able to estimate changes in GDP (gross domestic product) based on changes in luminosity. According to Stanford, Lee found that sanctions resulted in less luminosity in the countryside and more in urban areas. The gap between the two widened about 1 percent, according to his results. When the countryside was measured against central urban areas, the gap between the two widened by 2.6 percent with the imposition of sanctions. “The results suggest that the dictatorship countered the effects of sanctions by reallocating resources to the urban areas,” Lee said. What this means, he said, is that sanctions are having an exaggerated impact on the poor. “Sanctions will likely be inefficient as long as North Korea can maintain powerful centralized control and oppress any discontent that arises due to increasing inequality,” he said. One note from his study: usually such research is hampered by saturation of light sensors, when lights on the ground are so bright that they register a maximum value on the sensor making accurate measurement difficult. For North Korea, not one single light over 19 years of data hit this saturation point — not even the capital Pyongyang. Lee is an economist at Stanford’s Freeman Spogli Institute for International Studies. 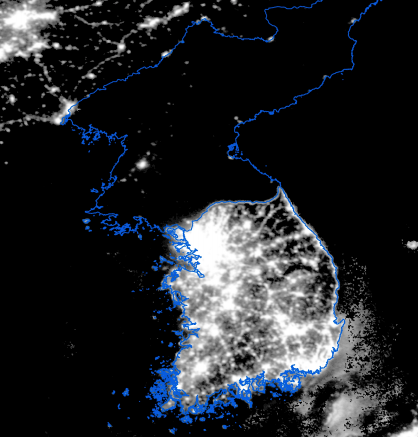 2 Comments on "North Korea’s lights tell story of economic redistribution"
Real life (and continuous) Earth Hour. Something every country should take an example from. but –major problem is they used hydro electric power to reprocess nuclear waste into weapon stockpile — caused severe draught in agricultural region–imperial government meant to produce food during colonization –aged and not in full capcity– mde worse ? food is one key factor to deal with rogue state under strong grip of supreme leader ?